Cycle parking has always been a problem in the Netherlands. There are so many bikes, and they take up a lot of space and a lot of innovative ways have been though of to deal with the bikes. One of the first, and perhaps the most famous, of the huge cycle parks is that in the photo above - the Fietsflat at Amsterdam Centraal Station. This dates from 2001 and can accommodate 2500 bikes on three levels. It's no longer anywhere near the biggest. 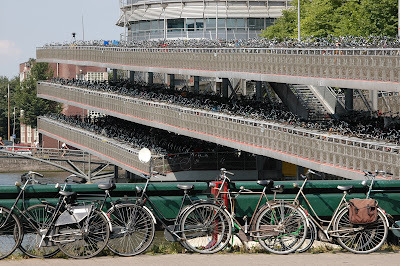 I have previously posted about Groningen's new railway station parking which accommodates 4150 bikes, bringing the total there to well over 6000 (since this was written it's been expanded and you now find 10000 bikes at the station). I have now heard that Utrecht is building spaces for no fewer than 20000 bikes at a new cycle park at the central station. Even Assen with its population of just 65000 will soon have 2300 spaces - nearly as many as in the fietsflat (this has also been increased to over 2500). The railway company here doesn't really want to upset cyclists, as four out of every ten train passengers arrive at the railway station by bike. However, they have started talking about the idea of charging for cycle parking at railway stations because the cost of providing it is so high. This is compounded by the problem of people dumping old bikes at the station. Another possible approach they could take would be to pay people to look after guarded parking at the station. It would make it easy to tell what bikes had been abandoned. "There are 900000 people in Amsterdam and 600000 bikes, and that this causes problems in the rush hour. What's more, cyclists have the same problems as drivers in finding places to park their bikes. You'll see a guarded double decker cycle park which dates from that time. They keep your bike safe, and you can book spaces in advance in order to make sure you will be able to park your bike regularly. Then there is the problem of bikes parked where they shouldn't be on the street, which get in the way and can look unsightly. Some are dumped or stolen. The police collected 2500 bikes off the street at this time, and reduced the rate of cycle theft. A hundred bikes were returned to owners who knew their frame numbers, 150 more were identified by their owners visiting the "bicycle graveyard" to find their bikes and the rest were auctioned." There are more cycle parking stories. The photo at the top comes from wikipedia. More details, and licensing conditions for the photo can be found here. In Dutch, "flat" refers to an apartment block, while in English, "flat" refers to a single apartment. Hence the reason for the name "fietsflat" - bicycle apartment block. better bicycles than trying to park that many cars! But still... it's not nearly the space problem cars create. We should have such problems in America. We have to live farther apart to fit all the cars in. Problem compounding problem. Wow, so many bicycles! Somebody once claimed that there are 800.000 bicycles in Vienna but less than 20.000 parking spots (well, it seems that most of the 800.000 bicycles aren't actually used, but still). Most people therefore have to chain their bikes to lampposts and traffic signs. Not a good solution. Authorities rather let cars park on the road than bicycles, there are fights over each car parking spot although more than 10 bikes would fit in the same space. Not chaining a bike to a fixed object isn't a very safe solution here, so I only do that if there's no other way. And parking a bike on a sidewalk is only allowed if it is wider than 2.5m anyway (that's not very often the case). I have noticed that the bicycle racks and fietsenstalling are always really busy at our station from a Monday morning (at 7am) until Friday evening and then suddenly lots of the bikes have gone. I keep thinking that students leave them there on a Sunday night and pick them up again on their way home on Friday. I have noticed some bikes that have been abandoned and have been taking up a space for months. What usually happens to those bikes? I assumed that they would take them away after some period of time and that sometimes happens if lots of bikes have been dumped infront of the station - never to the bikes that have been parked as far as I can tell. My first thought was...has to be less space then the equivilent number of cars. I would think that just by posting no overnight parking, that would help resolve some of the problem. At 2 am, a crew comes in and removes all remaining bikes. they are held for a few weeks, then if not claimed and the penalty fee paid, they are auctioned off. I'm afraid that closing the cycle parks overnight would not work. Lots of people have reasons to leave their bikes overnight. e.g. shift workers, people who leave a bike at the station because they live further away, people who have gone on holiday by train etc. What does happen occasionally is that bikes have labels attached saying when they will be removed (perhaps in two weeks time). If they remain then they are taken from the racks. Do the British love their children too ?